If you have ever stored a GIF file in Camera Roll, you might have noticed that the Photos app on iOS displays it as a still picture. The app keeps the original properties of the file intact, so if you want to share the animated GIF in any supported platform such as WhatsApp, Photos will let you do so. But if you want to view an animated GIF, you’ll have to resort to a third party app. GIF Viewer is a third party app available on the App Store which allows you to view and import Animated GIFs from Camera Roll, and also create GIF albums within the app. When you open a particular GIF using the app, the animation will play just like it is supposed to. The app also supports other features like GIF Frame viewer, GIF slideshow, GIF playback speed control, Zoom in and Zoom out in GIFs, and even converting GIF to video. 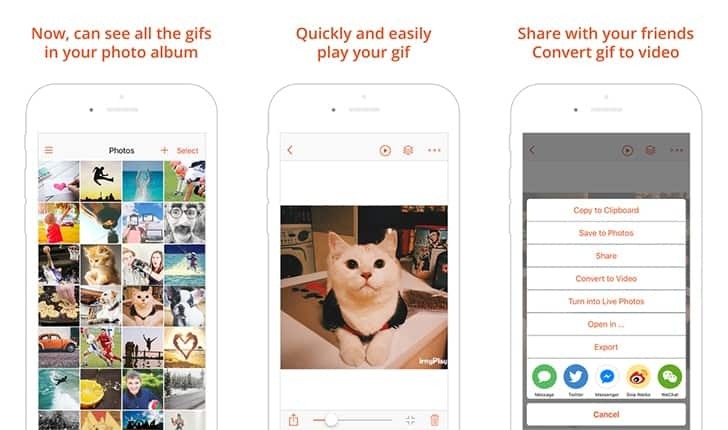 The app lets you import GIFs from a lot of other places apart from the Camera Roll. It supports iCloud Photo Library (iOS 9 or later), import from PC (using iTunes file sharing), from clipboard (tap and hold GIF and select Copy), from iCloud Drive, Dropbox or even from Twitter URLs. Once imported, GIFs can be directly shared via Email or on social networks like Twitter, Facebook Messenger, WeChat, etc. After converting GIFs to videos, they can also be uploaded to Instagram or Facebook. GIF Viewer is available as a free download on the App Store, for iPhone, iPad and iPod Touch.